Even though the city failed to generate any significant traction in the residential capital market during the first quarter of 2016, nearly 60 per cent of the tracked localities saw a positive trend in capital values. Metro project, infrastructure upgrades and the upcoming state election are seen as probable contributors. Affordability and availability of newly launched projects kept suburbs on the buyers’ radar. Peripheral locations such as Patuli, Barrakpore, Pailan, Narendrapur, Mukundapur and Santoshpur recorded growth of one to four per cent in capital values QoQ. As noted in the previous quarter too, residential micro-markets along EM Bypass continued to garner demand, thereby posting a rise in capital values. 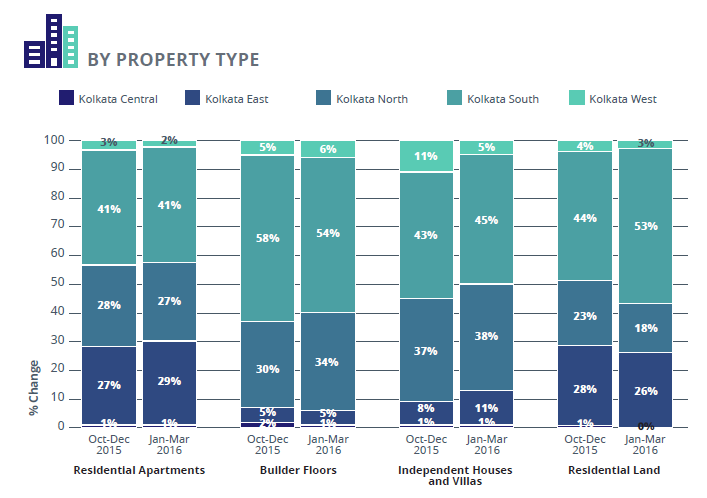 The rental market in Kolkata remained largely stagnant over the last one year with more than half of the tracked localities recording no change in values. 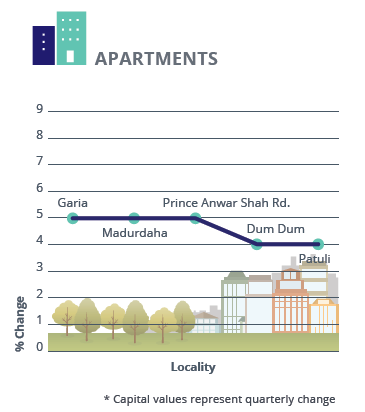 The southern stretch of the city continued to witness maximum activity in the rental market. 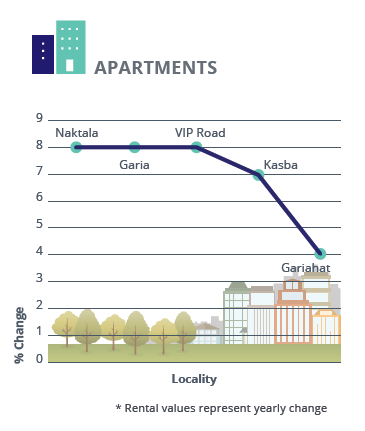 Naktala, Garia and VIP Road recorded the highest rise of eight per cent in rental values in the last one year (Jan-Mar 2015 to Jan-Mar 2016). While the presence of metro stations has augured well for Naktala and Garia, proximity to IT zones keeps rental market along VIP Road burgeoning. Unlike the capital market, rental market in the suburbs remained passive owing to lack of developed infrastructure, which kept demand from the tenant community at bay. 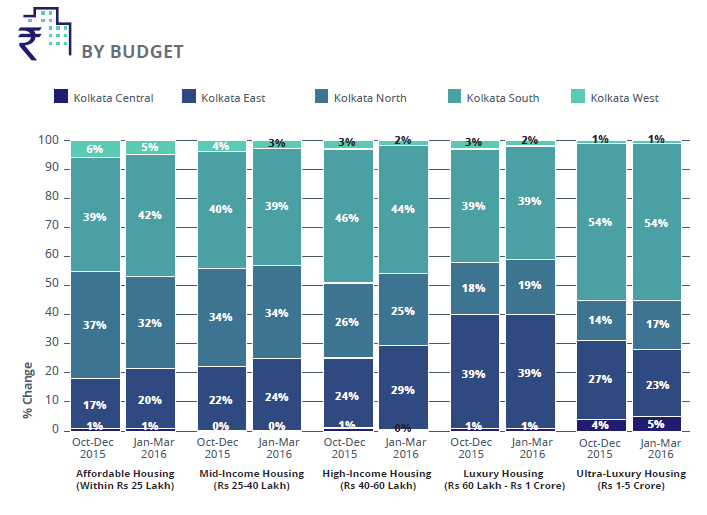 While new launches dipped and unsold inventory troubled the developers, Kolkata witnessed some traction in the affordable housing section. 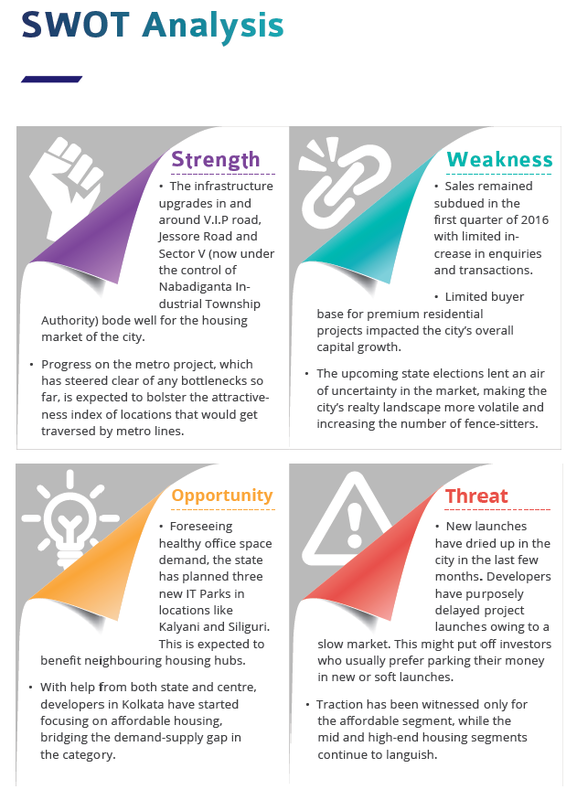 South Kolkata exceeded all other zones in the city with the maximum number of new launches. 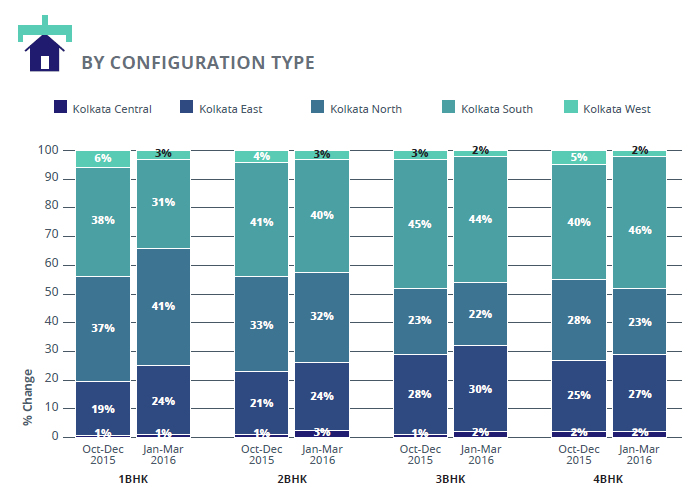 South Kolkata continued to capture the maximum share of residential inventory across all property types. While supply of apartments remained unchanged in the last six months, a drop of four per cent was recorded in the share of builder floor units in the zone. While more construction has led to limited land banks across the city, South Kolkata recorded a steady increase in the supply of residential plots. Supply in the category grew by eight per cent during Jan-Mar 2016, indicating that the city is expanding southwards. Localities such as Joka, Baruipur and Thakurpukur recorded the highest supply of residential land. Developers in the city continued to focus on the affordable segment. This was reflected in the supply statistics of both East and South Kolkat a. Supply of properties priced upto Rs 25 lakh witnessed a growth of three to four per cent in these zones QoQ. Supply of properties priced up to Rs 60 lakh witnessed an upward trend in East Kolkata in the Jan-Mar 2016 quarter. While a rise of two per cent was recorded in the supply of mid-segment housing a significant growth of five pe r cent was noted for high-income housing. Supply of luxury and ultra-luxury housing saw a slight upward trajectory in North Kolkata inching up by two to three per cent in the last two quarters. Supply of smaller configurations (1 and 2BHK units) witnessed a moderate rise in the eastern part of the city during the first quarter of 2016. North Kolkata, too, registered a rise of four per cent in the availability of 1BHK units. Supply of 3BHK units across different zones witnessed negligible fluctuations in the last six months. East Kolkata recorded a slight rise of two per cent in the supply of these units QoQ. South Kolkata netted the highest supply of 4BHK units This may be attributed to a slight increase in the supply of villa units in the South. 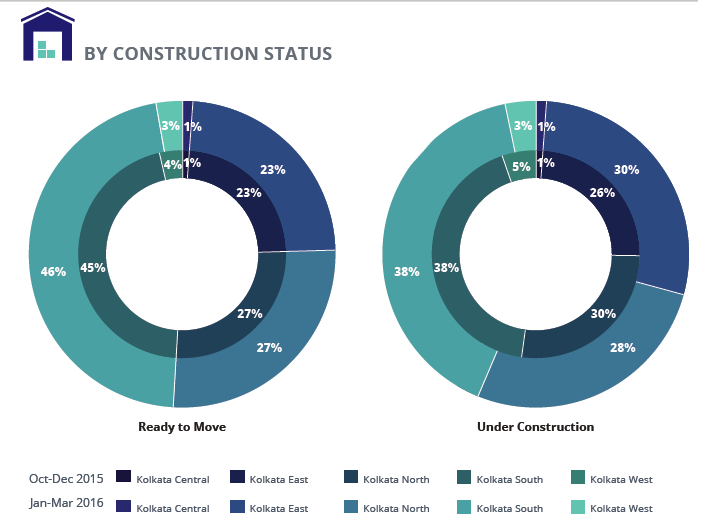 While supply of ready-to-move-in properties witnessed no change in East Kolkata, the zone witnessed a rise of four per cent in the supply of under-construction properties indicating few launches in the market. As observed in the last quarter, South Kolkata contributed more than 45 per cent of the total ready inventory in the market. However, hardly any movement was noted in the supply of ready units across zones indicating a slow market. Majority of the upcoming residential inventory in the city is in the affordable segment (up to Rs 25 lakh) followed by the mid-housing segment (Rs 25-40 lakh).